This is part 2 of D.S. Bunker’s guest post about West Yorkshire, England. She chronicles her life as a Pinay wife and mother in Cornwall, England in her blog, Indian’s Pages. 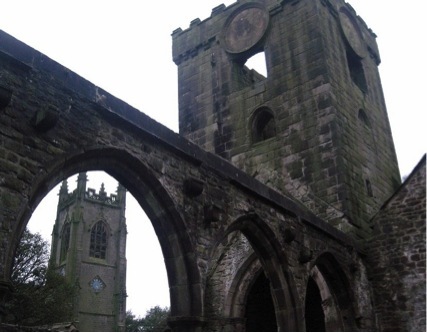 Once in Yorkshire, a stop-over at Heptonstall is a must, especially if you are a Sylvia Plath fan. 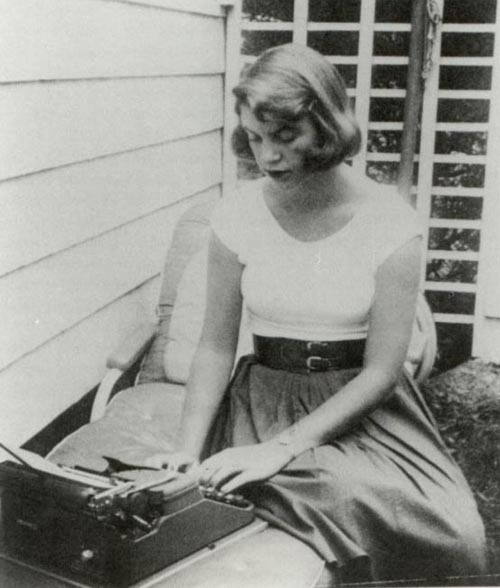 For those who are not familiar with S. Plath, she’s an American Poet who married the British Poet, Ted Hughes. She committed suicide after separating from Hughes in 1963. Unlike the Brontes who have been dead for more than 100 years, there is no fanfare surrounding the American poet’s grave. In fact, we had trouble finding it. After going through rows of graves, we finally found her. Her grave was decrepit. As if no one cared, as if she’s been forgotten. Save for the hundreds of pens left there by her adoring fans. Like Haworth, visiting Heptonstall is like being transported back to Victorian times – the streets are also cobbled, old buildings still stand. The old cemetery with its ancient graves and brooding 12th century church ruin and 18th century church still standing is also worth visiting. 12th Century tower of an ancient church in Heptonstall with the ‘new’ 18th century church tower also in view. While in Heptonstall, drop by the small museum which was actually once the old grammar school. During our stay in Yorkshire, we stayed at the White Lion Inn. According to the owner, when he first bought the pub, the previous landlord mentioned that Sylvia Plath and Ted Hughes used to come in for a pint or two. Rumor has it that they etched their names on the pub’s table. The couple weren’t famous yet, so the table was later burned. Where to Stay: Stay at the White Lion Inn if you don’t mind a creaky bed, wallpaper peeling off, a dingy bathroom, dirty microwave and fridge, a TV that doesn’t have any channels, a room without a key (apparently some guest stole it) and WIFI that won’t penetrate the thick heavy walls of the 16th century Inn. Oh and did I mention that the windows wouldn’t open? If a fire broke out the two nights we were there, me, my husband and my daughter would be toast. Other than that, the pub was great with a large open-fireplace, great beer, no food though and a very friendly landlord who keeps meaning to get things sorted out. That was his reply every time we queried about something. How to get there: Heptonstall is about 175 miles from London, on top of a hill overlooking the attractive little valley Town of Hebden Bridge. Trains run from London King’s Cross to Bradford Interchange. From here there’s a local service (the Caldervale Line) that runs to Manchester Victoria, stopping at Hebden Bridge. If you have flown into Manchester the Metro line will take you from the airport to Victoria Station. 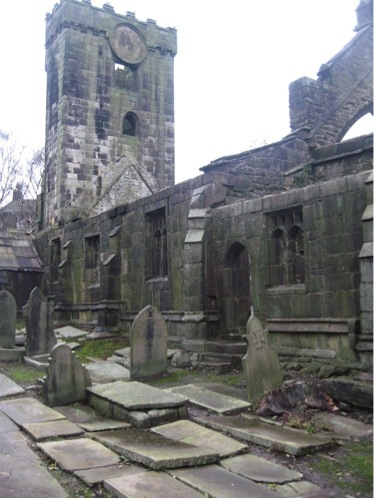 See the Bronte Sisters’ grave here. Like this post? Why not share it with your friends? You may also want to follow us on Twitter or Facebook!